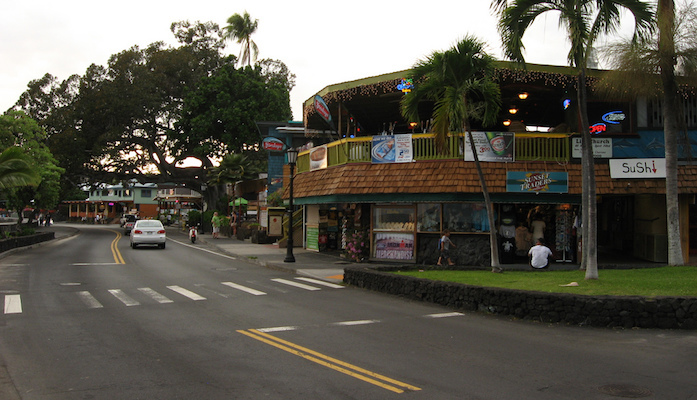 Alii Drive is far and wide the most popular running route in Kona, and perhaps on the whole Big Island. Our route goes from Kailua-Kona, at the intersection of Palani Drive, Alii Drive, and Kuakini Highway, then runs south along the coast with abundant ocean views for up to 7 miles one-way to near “The End of the World” — a good spot to check out volcanic rock and crashing waves. The first five miles are relatively flat, but the route gets pretty hilly from there on out. The run is so idyllic, it’s included in course for the Ironman World Championships. There is a nice wide shoulder for most of the way, and there are mile markers every ½ mile, so it’s easy to chart your progress. An added bonus: the route follows several beach parks with water and restroom facilities (approximately every 2 miles). 7 miles one-way. Can turn around at any point!